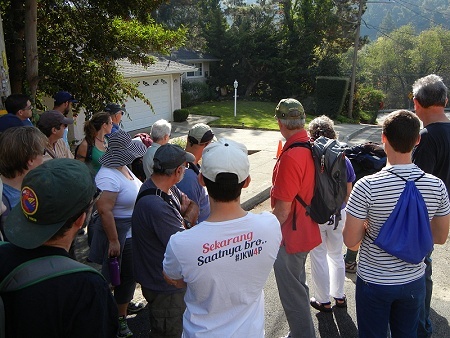 Saturday I led a walk for the members and friends of Wild Oakland to show off one of Oakland’s most striking places to encounter the Hayward fault. There was a nice turnout, about 60 people. I was glad to see so much interest. I hope that this post will enable those people, as well as all of you readers, to visit in person and learn more. 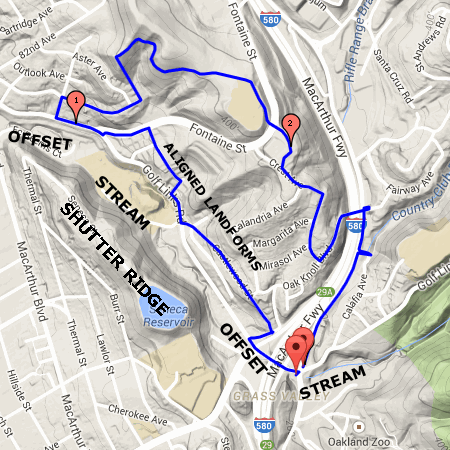 Here’s the route we took. It was just over 3 miles, although the altitude gain in the middle made some people bail out. Next time I’ll try to have alternative routes for their benefit. The numbers refer to the stops during the walk. The asterisks refer to direct evidence of the fault’s activity, both on and off the day’s route. Next is the same map with topography added. The thrust of the day’s exercise was to tour some distinctive features that the Hayward fault has left on the landscape. Stop 1, where we started, is where Arroyo Viejo does its abrupt 90-degree turn on its way from the hills to the bay. 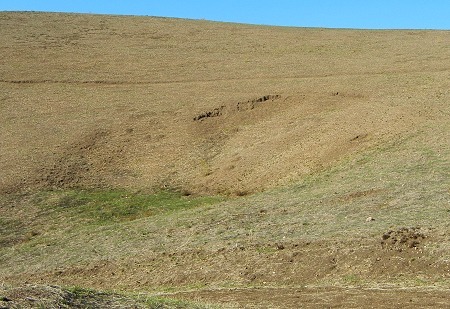 The right-lateral Hayward fault has dragged the Bay side of the landscape to the northwest, and the creek has had to bend in response. It’s a vivid example of how plate tectonics works in California, caught between the Pacific and North America plates. As the Pacific plate moves northwestward, pulled in that direction by subduction zones off Japan and Siberia and Alaska, it moves sidewaysright-laterallywith respect to North America. That distorts the courses of streams that cross the boundary between the two plates. That plate boundary is a wide zone with three main sets of major faults running along it. 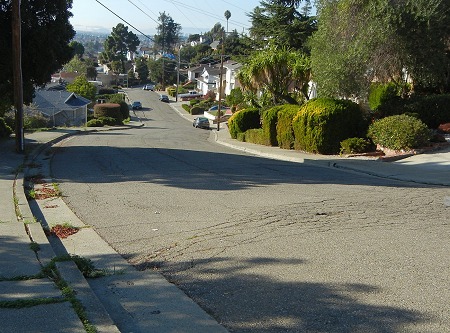 The Hayward fault is in the middle set. 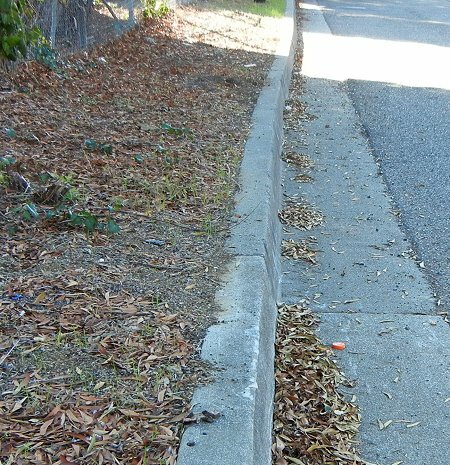 At Stop 2 I was able to point out a good example of creep offset, where the curbs on both sides of Encina Avenue have been cracked and shifted by creep (slow motion, less than 10 millimeters per year, without earthquakes) on the fault. At Stop 4 I pointed out another probable example of creep offset, and everybody turned on cue to look at it. Stop 5 was at a highly disturbed bit of ground on Ney Avenue. The scarp crossing the road appears to be the head of a landslide right on the active trace of the fault. I am quite taken with King Estates, and I believe it to be the largest piece left of the East Bay hills’ original landscape of grasslands. 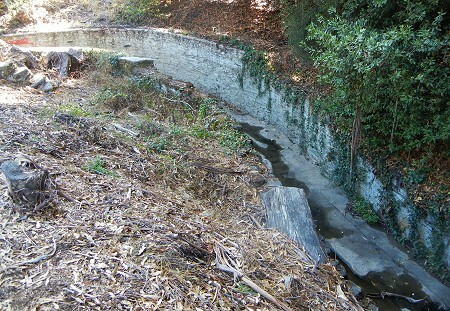 As the rains come this winter, I hope some Wild Oaklanders will poke around and examine it closely. For most or all of the people who came, it was their first visit. Along the way is this nice little example of a landslide. 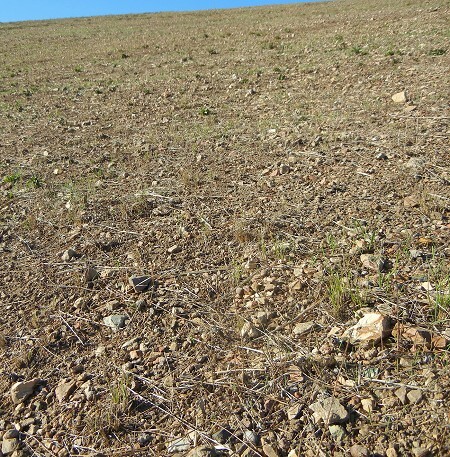 The King Estates hills are mapped as alluvium of an earlier generation than the Pleistocene alluvium that makes up East Oakland’s low hills. I wonder two things about them. Are they a pressure ridge, pushed up by compression across the Hayward fault? (I noted that the fault’s motion is 90 percent strike-slip and 10 percent compression.) And what is to be learned from the blend of stones that practically forms a pavement on the hills? Stop 7 was a view into the watersheds of the three creeks above the fault: Rifle Range Branch, Country Club Branch, and Arroyo Viejo. And Stop 8 was in the valley of Country Club Branch, so close to its neighboring streams but so well separated from them by elevated divides. I blame the fault, which keeps jolting the countryside out of the equilibrium it seeks. For dessert, I present a portion of Jim Lienkaemper’s 1992 map of the fault, which has annotations about the detailed evidence along it. The features marked G are geomorphicthings geologists notice in the landscape. Those marked C are hard evidence of creepoffset curbs (rc), sidewalks (rs) and fences (rf), and at Stop 2, echelon cracks (ec) across the road that have been erased by road repairs since 1991 when the map was compiled. You can download the whole map and consult the updated version from 2008 if you like. 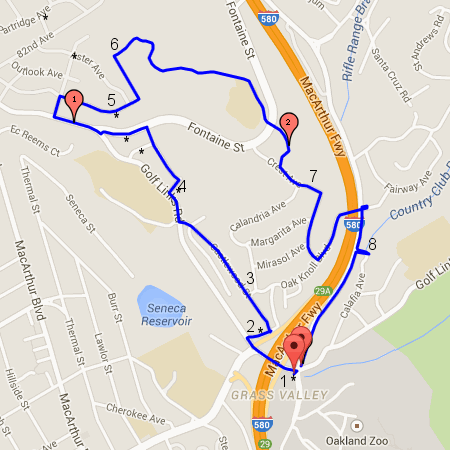 This entry was posted on 9 November 2014 at 4:13 pm and is filed under Oakland geology walks, The Hayward fault. You can follow any responses to this entry through the RSS 2.0 feed. You can skip to the end and leave a response. Pinging is currently not allowed. Looks like an interesting hike. I’m glad it was so well attended. 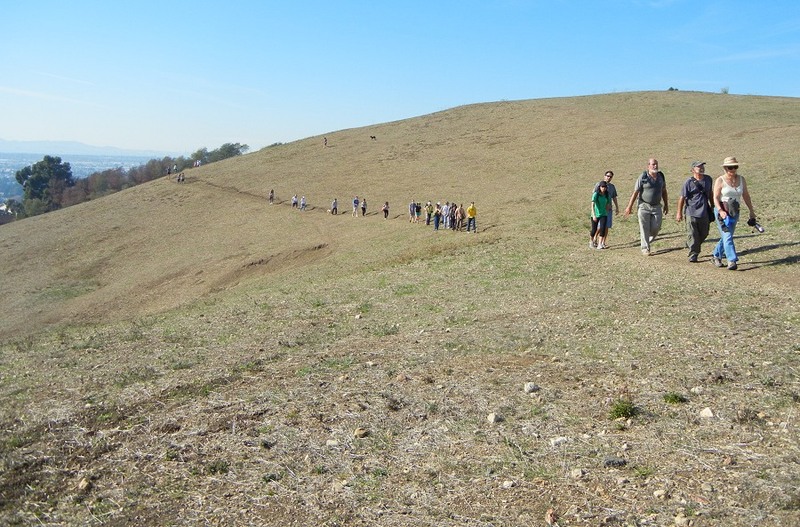 Wild Oakland has now posted its version of this walk, including some quotes from me. I’m glad that I sounded so cogent. Looks like a really interesting hike – I’m sorry to have missed it. 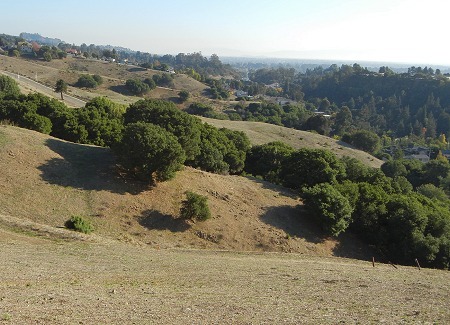 King Estates has some nice grasslands, but I believe that Knowland Park (just uphill from the zoo) has the largest and best native California grasslands remaining in the East Bay hills.